3Hcare is an initiative by a group of health care professionals to bridge gap between patient and healthcare services for an enriched experience. 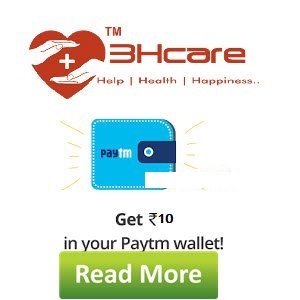 Now get Free Rs 10 Paytm Cash just for Registration at 3Hcare. You just need to signup and send one email to them. Valid only for new 3hcare.in Registrations. 3hcare.in reserves the right to reject any fake registrations. 3hcare.in reserves the right to change the offer at its discretion. Cashback will be given by 3hcare.in. This offer is valid upto 20th june 2016. How to get Free Rs. 10 PayTm Cash on Sign up at 3Hcare? Click on Register from top menu. Register (Don’t register by any facebook, gmail etc authentication). After Registering, send mail with Subject Cashback <mobileno> to [email protected] with your registered mail id. After verification, Rs. 10 paytm Cash will be transferred to your Paytm account within 48 hours. 2) Register using the Register tab at the top right hand side of the website (Don’t register by any facebook, gmail etc authentication). 3) After Registering, send mail with Subject Cashback <mobileno> to [email protected] with your registered mail id. 4) After verification, Rs. 10 paytm Cash will be transferred to your Paytm account within 48 hours. Address Book – We can now deliver your products to another address other than yours! Order History – View your history of transactions that you have made with 3H Care. Products Reviews – Share your opinions on products with other customers.